Having healthy and beautiful looking hands and feet is a great way to feel confident and a little bit posh. All of our services are done by professionals to ensure high quality and natural looking nails. We perform all pedicure treatments in a shiatsu massaging spa and bath chair to ensure the most luxurious and relaxing treatment for you. We use only the highest quality materials to ensure the protection of your skin and nails. 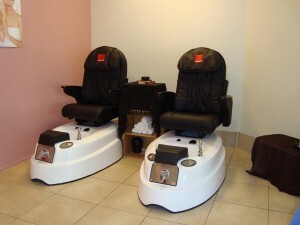 All of our nail treatments are set up in side by side chairs so you can bring a friend or partner. For the most natural but still beautiful looking nails, we’ll cut, buff and properly file your nails to your preferred length and shape to ensure they grow strong to prevent breaking and peeling. Then finish the look with a professional polish of your choice from our OPI range, one of the largest manufacturers of professional polish. In this treatment, your nails will be cleaned professionally all over and massaged to promote growth. Then, we file your nails to your preferred length and shape to ensure they grow strong to prevent breaking and peeling. We also include exfoliation for a fresher feeling and a free cup of drink as well. Then finish the look with a professional polish of your choice from our Shellac (extra $25) or OPI range, one of the largest manufacturers of professional polish. Your nails will be smoother, stronger and more even. This manicure is especially designed for the treatment of dry or tired hands. It involves a full manicure using extra warm paraffin wax wrap which will soften and hydrate your hands. We’ll also buff and file your nails to your preferred length and shape to ensure they grow strong to prevent breaking and peeling. This treatment also includes exfoliation and a free cup of drink. Then finish the look with a professional polish of your choice from our Shellac (extra $25) or OPI range, one of the largest manufacturers of professional polish. Your nails will be smoother, stronger and more even. This treatment includes exfoliation, massage and pedi paddle for healthy looking feet. Then we’ll cut, buff and properly file your toenails into your preferred shape. Finally, finish the look with a professional polish of your choice from our Shellac (extra $25) or OPI range, one of the largest manufacturers of professional polish. This treatment is especially designed for dry or tired feet. It involves a full pedicure using extra warm paraffin wax wrap which will soften and hydrate your feet. We’ll also buff and file your toenails into the shape of your choice and include a free cup of drink. Finally, finish the look with a professional polish of your choice from our Shellac (extra $25) or OPI range, one of the largest manufacturers of professional polish. For perfect looking nails, we offer a full application of gel nails to both fingers and toes, with your choice of length and shape. We use only the best products and trained staff to ensure your real nails will be safe and healthy underneath. You can choose out of pre-made designs or a polish of your choice from our Bio Sculpture range, one of the largest manufacturers of professional gel polish. For the ever popular French tips look, we offer a full application of French polish to both fingers and toes, with your choice of length and shape. For full details on pricing or to book a nail appointment, call us on (07) 3349 8313 or simply drop by to speak to one of our friendly staff members.